What Benefits Can You Get from Professional Pressure Washing in Boston? Your home is the most important investment you’ll ever make. For that reason, you’ll want to do everything you can to ensure your home’s health, longevity, and beauty. There are so many things you can do to keep your home looking beautiful that the list can seem mind-boggling. Plumbing work, floor renovations, kitchen remodeling: These are just a few of the things you can do and are EXPECTED to do to to maintain the best home possible. But while all of those things are great and, at times, necessary, they can also be quite costly and time-consuming. Though you surely want to get the most out of your home, you might not always have the time and money to undergo these procedures. However, there is one procedure that is quick, affordable, and absolutely wonderful for preserving the look and well-being of your home, and this procedure is a pressure washing. You might clean and renovate and maintain your home for yourself, but it’s not always just yourself you do those things for. Sometimes, you might find yourself doing them for other people: potential buyers, to be specific. If you think you ever want to put your home on the market, you’ll want it to look as great as it possibly can so that you can command the highest price and draw in the greatest number of interested buyers. And one area that should look absolutely STUNNING is your home’s exterior. After all, that’s the part of your home that buyers will see first, so you’ll want to make sure it makes the best impression possible. A pressure washing will make your home’s exterior sparkle like brand new, making it an absolute draw for potential buyers! The outside of your home is never safe from the elements. The rain, sleet, snow, and hail accost your home in a way that would make your mailman feel sorry for it. After enough years of elemental abuse, your home could begin to look bad, yes. But more than just looking bad, your home can begin to develop some pretty nasty growths: mold, algae, mildew, that sort of stuff. And it’s the sort of stuff that can negatively affect your health over the years if left untreated. A good, thorough pressure washing, though, will knock away ALL of that nastiness, leaving not only your home looking better but also you FEELING better. Your home isn’t the only thing that can benefit from a pressure washing. Your walkways and deck (should you have one) can also benefit. 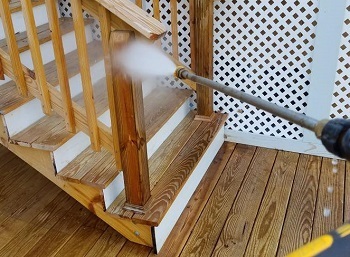 And a great way that a pressure washing can benefit both your deck and YOU is by removing slimy, slippery growths that develop on their walking surfaces. These growths look quite unappealing, but more than that, they are a slipping hazard. This hazard is especially dangerous if you are elderly or live with elderly people. A good, thorough pressure washing will remove these growths, making your home safer to walk about -- a great benefit on top of the aesthetics draws of a pressure washing! If you are in the market for a professional pressure washing, then call the experts at Nicks Pro Painting today. We have the experience and the know-how to provide you with the best pressure washing out there! Does your property need a professional pressure washing in Boston, MA? Call 508-745-7352 or complete our online request form.